9 Commercial Real Estate & Properties in Landsborough are listed in 3 categories. We have 4 Retail ShopsSale & Lease , 3 Development LandsSale & Lease and 2 Industrial Warehouses Sale & Lease . 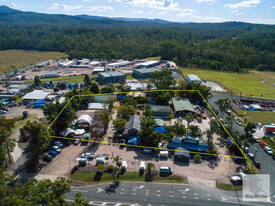 Ray White Commercial Northern Corridor Group as exclusive agent is pleased to offer for sale the freehold interest at 77 Caloundra Street, Landsborough QLD. The property is located on a high exposure, key thoroughfare linking the Sunshine Coast corridor to the surrounding hinterland region. The property offers 6,500m2 of prime development land in a Specialised Centre Zone permitting a range of possible uses (STCA) including but not limited to: Agricultural Supplies Store Hardware and Trade supplies Service Station Car Wash Food and Drink outlet Shopping Centre Showroom For further information or to inspect this property contact our exclusive marketing agents Jordan Hayes 0417 999 331 or Michael Shadforth 0488 981 076 today.